Model Boat and Ship Plans Explained. 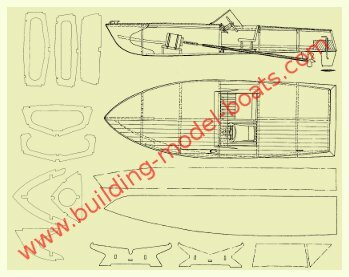 Ship plans useful to model boat builders essentially come in three types: scale plans of the real vessel, drawings for plank-on-bulkhead construction or general arrangement blueprints. Ship plans are drawn up to describe the shape of the three dimensional hull on a two dimensional plan. Sometimes contemporary plans of a historic vessel are preserved if you're lucky, however most ships throughout history have no surviving records at all. A most basic example of a lines plan. If documentation do exist, it may not always be the original construction plans, but can also be plans drawn up for refit or in some cases to document captured enemy ships. It can also be plans drawn up as a historical record researched from many archives, sometimes specifically for model builders. Sheer Plan - non-naval architects would call this "side view". The curved lines are called buttocks and slice through the hull parallel to the symmetry plane going down the middle of the hull. Waterline Plan - this would be the hull seen from below (or above if you think of it as transparent). The curved lines are parallel to the waterline or another datum plane near horizontal. Sometimes these lines are parallel to the keel or a zero-level referring to a construction floor. The actual load water line (LWL on drawings) is probably the most common as a datum. Body Plan or Hull Sections - this view shows the sections if you were to slice through the hull like a loaf of bread. The plan is almost schematic in nature with no other detail than the hull geometry. The location of the sections (or more correctly, stations) are straight lines on the other two views. To finish a scale model you also need a general arrangement plan. Typically you'll need a side view and a plan view. An example of a general arrangements plan. General arrangement drawings show deck layout, wheel house, bridge, davits, anchors, funnels, guns etc. Some builders go freestyle once they have a hull they like and come up with their own GA layout - inspired by a real vessel or not. Inboard profile and Sectional views can provide information that may not be visible on any view on the GA plan. 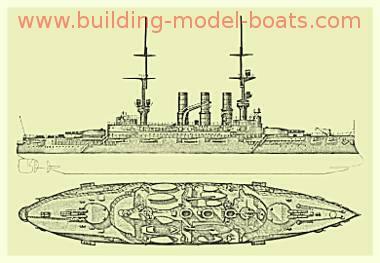 For smaller vessels these plans are not necessary, unless you are attempting an unusually ambitious model with interior details etc. Sections can often help understand the purpose of some deck fittings and details that landlubbers (such as myself) wouldn't normally recognize. Some of the information provided on the hull lines plan is redundant for model boat building. Many plans drawn up for the purpose of model building come with a GA plan and side view, and the body plan. As long as the stations are marked on the side view - this format is perfectly adequate for the purpose. If a GA drawing is all you've got you may be able to build a water-line model or recreate your own hull lines. The latter can be a challenge to pull off convincingly if you lack experience, and the result should probably be categorized as semi-scale. An example of a rigging plan. 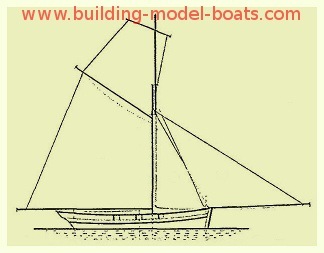 If you are building a sailing ship a <b>rigging plan</b> is most helpful. However, rigging was rarely well documented in the age-of-sail, so many times other references will have to do. Generally, the older your subject or poorly documented, the more experience (or guesswork depending how you look at it) will have to go into it. Most plank-on-bulkhead plans are either freebies from magazines or originally intended to go with a kit. The bulkheads, keel and other components are laid out flat on a drawing sheet. All you need to do is copy the shapes onto your lumber, cut them out and start building. An example of a model boat plan. 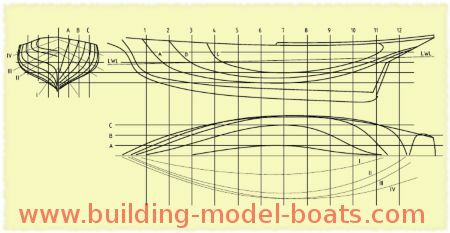 A model ship plan for plank-on-bulkhead construction can be difficult to convert if you want to use another building method. Building a working model using a plan intended for a static model can also pose problems due to obstruction from internal structure and limited hull access. Water-line-model plans are essentially a General Arrangement (GA) plan and are most common in small scales (1:600 and smaller). It shows the ship in a plan, side and sometimes a frontal view. This kind of drawings is also common in maritime books that are not geared specifically toward model builders. The classic scales for model boats and ships are 1:16, 1:32, 1:48, 1:64, 1:96 and 1:192. In between are lesser common scales like 1:24 and 1:144. These scales are still dominating in the UK and USA. This system is based on inches or fractions of inches to a foot. It goes back to before the metric system when the whole world operated on the twelve-inches-to-a-foot-rule. Most antique ship models from the age-of-sail you’ll see in museums are of one of these scales. Since the metric system scales like 1:25, 1:50, 1:100, 1:150, 1:250 etc. have marched in. These scales are especially dominant when dealing with plans and kits from France, Germany and Japan. Museum models of steam and warships in continental Europe are commonly in one of these scales. 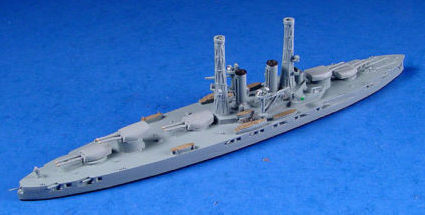 A 1:1250 scale pewter or wooden model warship. The 1:1200, 1:1250 and 1:2400 were originally introduced around WW1 for training military personnel in spotting and identification naval vessels. Many were cast pewter or wooden water-line models. People build and collect ships in this scale either for the shear fun of it or for war gaming. Speaking of war gaming…There are a group of nutballs that build warships with BB guns and shoot each other up until one is sent to Davy Jones's Locker. The most popular scale is 1:144. This scale makes most WW2 battleships and cruisers manageable in size. They even have “official rules” and large get-togethers where model warship combat fleets clash and sink each other – all in the name of fun. You’ll also find odd scales like 1:33, 1:47, 1:57 etc. usually among plans and kits out of Spain or Italy for some reason. Plastic model boat kits also come in strange scales sometimes. I’ve seen 1:110, 1:120, 1:350, 1:600, 1:700, 1:720 etc. Many rail-roaders have over time bridged over into model boat building. With them came a bunch of rail road scales into this hobby. In the same fashion war gaming and military figures have less traditional scales that have been trickling into the model boat hobby as well. One obvious benefit is if you need crew figures or accessories that are inexpensive and easy to come by in the realm of model rail road or military modeling. But does scale really matter? Maybe not, it depends. It’s nice to stick to a range though. A 1:350 RMS Titanic next to a 1:16 steam tug looks kinda silly. The same Titanic next to a 1:200 scale battleship will look a lot better. But in the end it is important to remember to have fun!